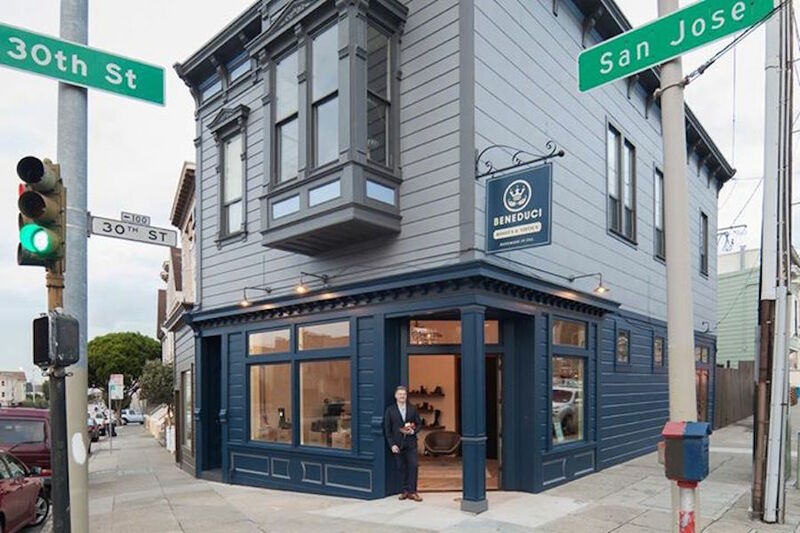 There’s a new shoemaker in the La Lengua Autonomous Zone: Beneduci Shoemakers just opened up an honest-to-goodness boot factory and store on the corner of San Jose and 30th Street. Beneduci shoes have a foot in both lands. The hardy boots may have American workwear leanings but are far more refined, in both design and materials, than anything you’d wear to clean a flooded basement. I do own a pair of Beneduci boots that Frank made for me before the store opened. I love them. I’ve never owned a pair of handcrafted shoes or boots; these feel amazing. It’s not hyperbole when I say I can walk miles in them all over the city. Frank is so passionate about bringing meticulous craftsmanship to San Francisco, and he delivers it in such a down-to-earth way. 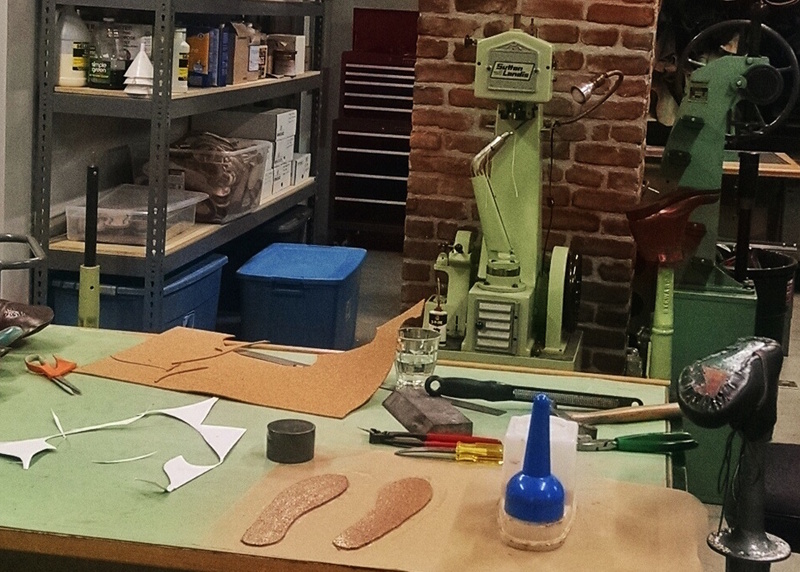 The store is beautiful and welcoming—you really can go in and see all the equipment and the shoes being made. It’s a great addition to Bernal. 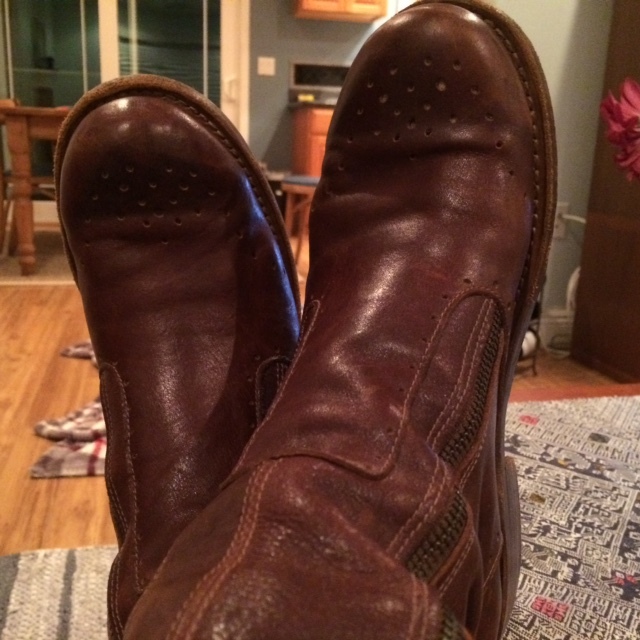 I’m attaching a photo of me in my boots at the end of the day. PHOTO: Top, Beneduci Shoes via Facebook. Interior photo by Ted Weinstein. Boots by Renee. Anyone know, ballpark, what a pair of boots cost? Looks to be $275 – $725 depending on the model. Welcome to our humble ‘hood Frankie Beneduci! May you find much success here and may many Bernal-dwelling shoe fanatics soon don your soles! I noticed that store the other day. it looks great! I was surprised, though, because there’s another shoemaker on Church between Day and 30th. That person does very different work but still I thought it was notable that two custom shoemakers are situated so close together. You can’t walk into that other shoe store for $300. I got a simple pair of black suede Beneduci’s before the store got redone and opened. They are snug, comfy and get comments wherever I wear them. Nice!! I live directly across the street from this place. I have yet to see a single customer inside the store. This is another store that that seems to be indicative of the trend this neighborhood has taken in the 8 years I have lived here. Interesting. They did a beautiful job with that building ! Looks so much better than it has in years ! I bet the shoes are just as beautiful ! I’m still a little bitter Pacific Wushu had to leave that space, where lots of neighborhood kids and adults enjoyed martial arts classes for years. Now I drive my daughter to West Portal, where Pacific Wushu found another space, thankfully, so she can continue taking classes. Can’t say me and my freakishly high arches wouldn’t appreciate a pair of custom-made boots though.